Friday, October 27th, 2017 at 1:59pm. Wednesday, October 11th, 2017 at 12:43pm. Our hot summer is over and it seems that our hot market is too, other than with a few specific property types, price ranges and neighbourhoods. 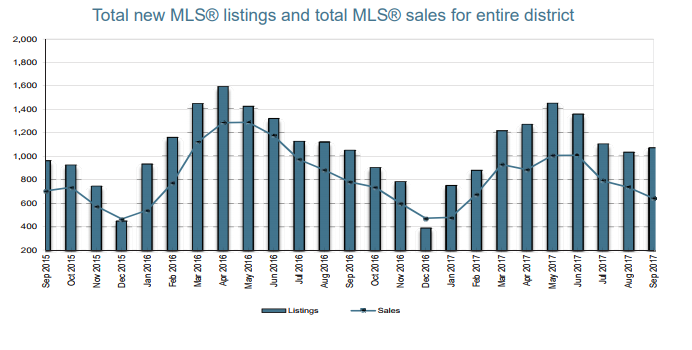 The volume of sales reported each month since May 2017 has declined each month, but surprisingly the number of available active listings has remained low, hovering just over 1,500 active residential listings. There were 640 sales reported last month in Greater Victoria which while was 18% less than the 781 reported sold in September 2016, is still more than 10% higher than the 10 year average of 573 sales in September. The number of total listings (including commercial and lots) at the end of September was 1,976 up 3% from the previous month and 4% less than the same time last year.